The TCL 65″ 6 Series TV (65R617) is an amazingly capable display for the $900 asking price. From its support for HDR including Dolby Vision, to the 120-zone FALD array that ensures high contrast with deep blacks, this is a TV that packs in the features. What make a gaming TV different from a regular TV? The short answer is that input lag matters more than any other parameter. Fortunately, many of today’s TVs have a surprisingly low latency Game Mode, but how they handle 4K and HDR is another matter. A great gaming TV is one that can do justice to the latest video formats including HDR, while keeping up with the action. HDR has truly caught on in 2018, with numerous marquee titles on popular gaming platforms like Xbox One and PlayStation 4 bringing next-generation graphics home. HDR helps games look much more realistic by providing lighting and shading mimics reality much more closely than what SDR can achieve. Arguably, HDR makes a bigger difference with games than it does with movies. With HDR graphics, you see more tonal detail, including in extreme highlights and deep shadows, versus SDR. And because HDR uses 10 bit graphics, the gradation is finer; consequently banding is avoided— now you can have deep blue skies that look as smooth as silk. Of course there are plenty of games that are not available in HDR, but support for 4K is much more common and the UHD support of the TCL 6-series means you can sit a comfortable distance from the huge 65” screen, and still taken all the extra detail that 2160×3840 graphics offers. A Gaming TV of a Home Theater TV? Home About Both? If you do have HDR titles to play, either on an HDR capable computer or console, you will be rewarded with exceptional visuals. Moreover, this 6 Series 65″ TV supports all three of the major HDR formats: HDR 10, Dolby vision, and hybrid-log gamma (HLG). This capability is also a boon for movie lovers (Whether it’s UHD 4K Blu-ray or UHD streaming via iTunes, Vugu, Google Play, Amazon, etc.) and anybody who enjoys 4K UHD HDR shows like what Netflix and Amazon offer. And even TV viewers will appreciate the good motion handling of this 60 Hz TV, for example in watching sports programming. In my review of the 65″ TCL 6 Series, I touched upon its suitability for use as a gaming display. The reality is that on the popular TV review site rtings.com, the 6 Series earns its highest score under the Video Games category, with a score of 8.6 and once you delve into the details, it’s easy to see why. Good motion handling, flexible video format support with HDMI 2.0, and low latency/input lag immediately stand out as gamer-friendly. I’m just recently getting into playing on this TV with the two games I’ve been wanting to check out: Red Dead Redemption 2 on an Xbox One X, and South Park: The Fractured But Whole on my GTX1080 PC. So far, each achieves a level of fidelity that makes them a competitive experience versus linear narrative, even from a pure audio-visual perspective. Plus, since the TCL is truly PC compatible (2160/60p 4:4:4) and calibrates really well, it’s a pleasure to use with a PC for video editing and Photoshop work. What an amazing canvas you get to play with for under a grand, hard to believe we’ve arrived here so quickly. I put the 65″ TCL R617 in my living room, on a TV stand. I connected the Xbox One X, as well as my PC, to a NAD T777 V3 receiver and connected the AVR to the TV. The audio system is a 4.1 configuration using Paradigm Prestige speakers and a Rythmik G25HP subwoofer. Consider that the sound system costs well over 10X as much as the TV, and yet the TCL’s visuals kept up with the high-fidelity sound. Wow! However, now is probably a good time to mention that the built-in speaker performance on this TV is not exactly the best. I would strongly recommend getting an auxiliary sound system if you’re a gamer, even if it’s headphones or a soundbar. But also, the simple fact is this TV looks and performs at a high enough level to go great with any sound system. In terms of settings, for SDR in my mixed-light environment, under Options I Set TV Brightness to “Brighter” and set the “Picture Mode” to “Movie.” And crucially, under Advanced Picture Settings I turned Game Mode “On.” The TV warns that the lower latency will result in a slight decrease in picture quality, pragmatically speaking the picture quality difference is nothing that you’d notice, whereas the improvement in responsiveness courtesy of game mode is immediately apparent.For HDR, with Game Mode turned On, instead I used the “Bright HDR” picture mode, and set TV Brightness to “Brighter.” The gets the TV cranking! A couple of key adjustments are under “Advanced Picture Settings.” I turned on “Local Contrast” and set it to Low, for just a bit more contrast “pop” and most importantly I switched the color temperature to “Warm.” From there, it’s just a matter of running the internal calibration using the game’s settings. Whoa. Red Dead Redemption 2 immediately puts the TV to the test, which the TCL passes with flying colors. The opening scene, with the snow and the lanterns, immediately sets the high bar for what I’ve seen come out of this console. It’s still CGI, but it looks so good it comes across as art—we’ve crossed the uncanny valley into a realm of Practically unlimited artistic and creative potential. In this TV gobbles it up, delivering lighting effects such as the moon behind the trees shining through falling snow, in the dark with backlit horsemen that are one step away from Hollywood. Perhaps the most astonishing thing is that even if you sit extraordinarily close to the TV (Perhaps 3-4 feet away) you simply see more more detail, not flaws. You start to notice each individual glistening flake of snow, and how the horses hooves interact with that snow. It seems that in this game, every individual pixel is accounted for, and properly rendered by the TV. A visual tour de force. Here is an interesting thing about Red Dead Redemption 2. Apparently, the HDR rendered by the Xbox One X basically serves up the same tonal range as SDR. You can think of it as “HDR for SDR” or “SDR that works in HDR mode” but either way it looks gorgeous, as long as you have the TV set up to deliver an accurate, bright, colorful, contrasty image. Indeed, it takes some effort to keep this game from looking awesome on this TV. Bright, Movie, Game Mode On, with HDMI 2.0 turned on is all you really need to remember. One of the differences between setting up a TV for gaming and setting it up for movies is how you dial in the deep shadows. With games, you want to be able to see into the dark corners, in case and enemy is lurking there. With the TV that’s calibrated for movies and home theater, you want those extremely dark details to be barely noticeable, because cinematographers like to hide monsters in scary dark places, the ones that jump out and surprise you. 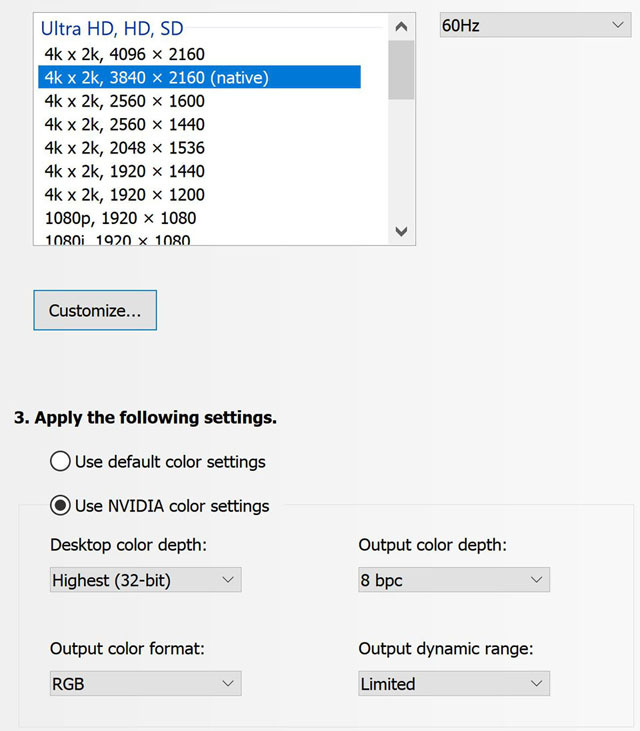 Anyhow, the point is that you should tweak the TV settings to suit your gaming needs and use a different set of settings for watching movies or TV shows. Now, I must confess, what happened to me once I started playing was both what I’d hoped for and what I most feared. I truly fell into the game, it took mere minutes to become completely absorbed by the sound of the visuals. Especially the visuals, because video game sound has been tremendous for some time, but truly visually seamless games are incredibly difficult to accomplish, especially at this level of artistry that required genuinely Herculean effort from Rockstar Games. Indeed, my understanding is that this franchise hired well over a thousand actors, all Screen Actors Guild card-carrying professionals, for the motion capture involved in this game. If you play on a display that doesn’t do justice to the production quality, it would be diminished. And yet, it is also a true videogame, rewarding decent reflexes, so the fast response of TCL’s 6 Series TV is appreciated. The high native contrast of the TCL—over 5000:1 per rtings—lets the TV render graphics that “pop” and especially so with the richer colors of HDR with wide color gamut (WCG). Indoors, during night scenes, this translated to incredible lighting effects coming from lanterns and flames. For example, the flames Coming from the logs in the fireplace have a rich orange hue to them, along with orange sparks and embers, while the light coming from lanterns has a colder (i.e. closer to neutral white) hue, as would be appropriate for the hotter flame. And, I can’t help but be blown away at how HDR is effectively rendering the flame itself within these lanterns, nothing is blown out… you see every single detail, every nuance that is imbued into this videogame masterpiece. Commendably, all of this is rendered with high contrast and very few clouding or halo-type artefacts. Scene after scene, the game looks spectacularly cinematic on this TV. OK, next up is South Park: The Fractured But Whole. Here’s a game I gladly spent 60 bucks on for the Xbox One version, then sat on for months without launching it because I had no time, and now it’s $15 on Steam. That’s actually great news because I wanted to compare the same game running on an Xbox One X to a GTX 1080-equipped PC. Long story short…. setting the PC to 2160×3840 and graphics to “High” produced the most visually compelling representation of the South Park world I have ever seen. So, it’s a beautiful thing that this TV came along and gave me an excuse to put in a few hours of “not-so-serious” gameplay. What makes this experience remarkable is the simple fact that a PC can render South Park in 4K and make it look better than the TV show itself. The first, most striking element of the game, visually, is the color. No longer bound be good ole’ rec.709 (BT.709), you see crimson reds and true blues and forest greens in the cartoon palette, the richness and intensity of these primaries are a clear step above what the broadcast version of the show can convey. It’s not full-on HDR but it’s definitely eye-popping stuff. While it’s lost some of its luster through familiarity, Grand Theft Auto 5 Online represents my largest-ever investment in a video game, financially as well as time-wise, so I’m not going to stop playing that character anytime soon. While the platform has aged a bit, and it lacks HDR, it’s still a great looking SDR game and the TCL 6 Series had Los Santos looking as slick as ever. Night scenes of the city are particularly satisfying thanks to the contrasty, colorful, sharp 4K picture of the TV. Moreover, I was able to hit 60 frames per second fairly often with graphics settings that make GTA V on a console look quite antiquated in comparison. But quite frankly, looks aren’t everything when it comes to GTA V. It is a kinetic game, the vehicles have distinct characteristics and interact in an arcade like, yet oddly realistic manner. The key thing is that you can take advantage of a high-performance display and win races, score more kills, and generally wreak more havoc if you have a system with low input lag. Yet at the same time, you can take advantage of the 4K resolution plus large screen size when scoping out your adversaries. Recently, I’ve strayed away from PC-centric gaming due to the quality of new-releases on consoles. I know the list of supported games has grown, but with Red Dead Redemption being console-only, my gaming time and dollars are Xbox One X bound. Nevertheless, I do have a couple of PC HDR titles to test: a copy of Mass Effect: Andromeda and Shadow Warrior 2. The best bet here is to use HD (1080 x 1920) resolution with HDR, and enjoy the consistent high frame rates that yields; 4K will only work with HDR in 30p.However, if you want to go sightseeing in some gloriously detailed world, then maybe 30p 4K HDR works. Or, if you can get consistent 60 Hz in 4K from your card, then SDR 4K 60p is truly a thing of beauty on this TCL. 60 Hz 4K also translates to better motion resolution than you’re likely used to seeing in games—virtual car racing is fun with this TV. OK speaking of car racing… Forza Horizon 4 on the 65R617 is a perfect way to enjoy an HDR 4K driving experience on a console. Launching the game on the Xbox 1X, the HDR logo flashes on the top right of the screen and it’s showtime. A quick tweaking of the display setting produced an optimal image in HDR, zero complaints. The payoff with HDR is clear—silky-smooth gradations and a sense of depth that comes from the realistic depiction of reflective surfaces in high definition and with HDR specular highlights. That translates to shiny paint jobs on the virtual automobiles with chrome that glints just right. It makes the sky look like a postcard photo, instead of a cartoon drawing. Even water droplets have more dimensionality. During gameplay, I never saw any screen tearing. 4K HDR gaming on the TCL looks and feels seamless. Puddles glisten, the road surface reflects the sun “just right” and in the end she arise in your brain start to suspend belief thanks to the uncanny realism of the game, as rendered on this TV. Other small but impressive details include how cars look as they transition from sunlight to shadows while going under trees, and the high contrast achieved when there are neon lights or fireworks in the scene. Now, this 65R617 TV‘s video game prowess does not come as a complete surprise. Last year’s TCL 55″ 6-series TV, which was only available in a 55 inch version with a plastic enclosure, was also impressive. But this is a larger, better performing TV overall.The R617 is so good at what it does when it comes to games, it’s a hard to imagine most gamers wanting or needing anything more than what it offers, at least aside from competitive gamers who need higher frame rates and effectively zero latency just to have a shot at winning. But even a hard-core gamer can surely appreciate the aesthetic superiority of a marquee title played on a calibrated TCL 6 Series TV. The Cliff’s Notes version is that while the TV is fairly accurate out of the box, A proper calibration makes it perform commendably well, with reference-quality color accuracy. Moreover, because the TV uses the app to dial-in settings, even an amateur can work their way through the calibration process so long as they have a decent meter. DIY calibration need not cost a fortune, either. If you skip worrying about gamma tracking in the very darkest shadows (where a pricey meter is a must to “get it right”), but you nail color balance and peak luminance then you can turn a small(ish) investment in software plus a meter (SpectraCal CalMAN RGB Bundle Monitor Calibration Software with C3 Colorimeter) into a superior visual experience, whether its for gaming, PC use (Photoshop is a dream with a calibrated 65R617) or for TV and movies. For gamers on a budget looking for a stunning display on which to experience their favorite titles in 4K HDR at a 65″ screen size, there’s likely no better bang for the buck to be had… anywhere. It may not have variable frame rate or a 120 Hz mode, but for the extra cost of buying a TV as good as this with those features, you can buy an Xbox One X and several games. Or you can upgrade your PC to the latest graphics card. Post-calibration accuracy on this TCL is fantastic, good enough to trust it for video editing or photo color correction. And when you watch movies, With this TV, you can rest assured you are seeing the colors and gradations that the director intended you to see.Thanks to its ability to handle 4k at 60Hz with 4:4:4 chroma, the 65R617 is able to serve as 65″ PC monitor, which represents unprecedented value. It’s an emphatic Top Choice among affordable gamer-friendly TVs for 2018, in addition to being a great TV for sports, movies, and anything else for that matter. 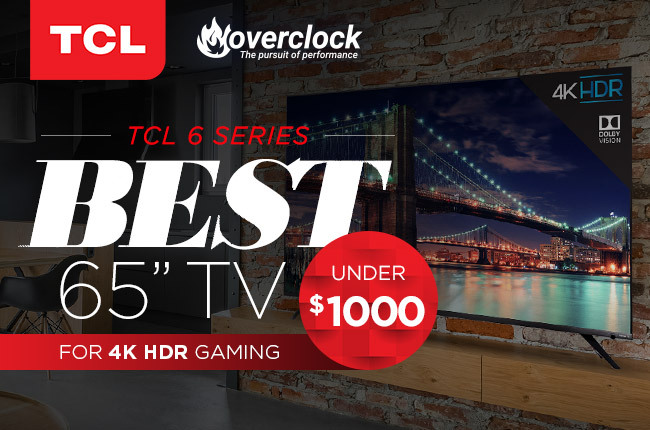 TCL hits a home run with the 65″ 6-series. It’s already an AVS Forum Top Choice for general usage, and that designation emphatically applies to its use as a gaming TV as well.